Practice l ink.com F A ll 2018 43 Call our physician recruiters at 1-978-573-4300. Or email your CV and letter of interest to NSPGPhysicianrecruiters@partners.org. www.JoinNSPG.org/PCHospPL/PL ONE TEAM. ONE FOCUS. One thing sets North Shore Physicians Group apart—our singular focus on the patient. From the beginning, our practice was founded on the principle of physicians, administrators and the community working together to provide better health care. 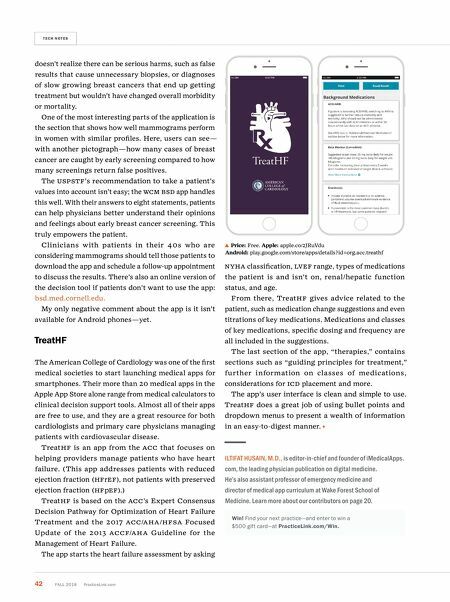 Today, that focus continues to drive us to be innovators, collaborators and trusted care providers. NSPG Hospitalists enjoy: • Working at North Shore Medical Center, a U.S. News & World Report Top 5 Boston Hospital • Hospitalist opportunities for daytime and nocturnist positions • Opportunity to teach and mentor IM residents NSPG Primary Care physicians enjoy: • Working in a Level 3 NCQA Patient-Centered Medical Home practice • Reasonable, telephone-based call coverage • Opportunities to teach residents and medical students • Leadership that values your input and understands the importance of work/life balance Do you share our philosophy? It's time to join our team. 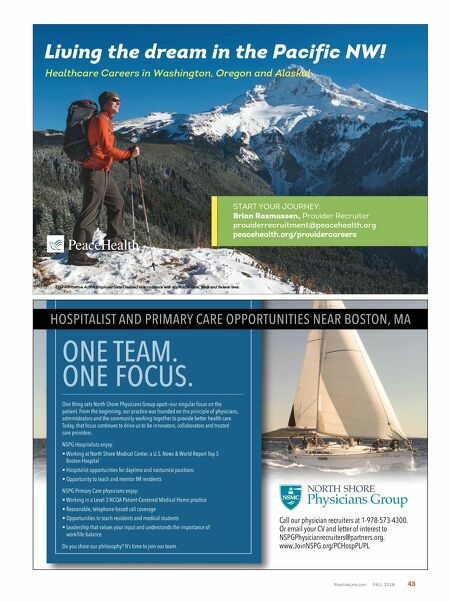 HOSPITALIST AND PRIMARY CARE OPPORTUNITIES NEAR BOSTON, MA Healthcare Careers in Washington, Oregon and Alaska! Living the dream in the Pacific NW! START YOUR JOURNEY: Brian Rasmussen, Provider Recruiter providerrecruitment@peacehealth.org p e a c e h e a l t h . o r g / p r o v i d e r c a r e e r s E E O A f fi r m a t i v e A c t i o n E m p l o y e r / V e t s / D i s a b l e d i n a c c o r d a n c e w i t h a p p l i c a b l e l o c a l , s t a t e a n d f e d e r a l l a w s .